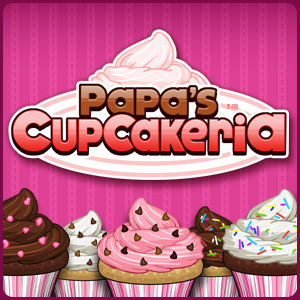 Slice and serve the most delicious sushi around in Papa’s Sushiria! 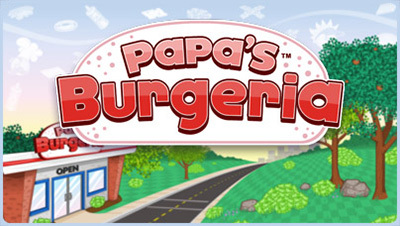 You’ve started a job at Papa’s new restaurant in Sakura Bay, where you’ll create a variety of sushi rolls and bubble tea for all of your wacky customers. Unlock and use over 140 ingredients for all sorts of delicious combinations across 12 different holiday seasons. The all-new clothing system lets you get creative with your workers’ holiday outfits, where you can mix and match colors and styles to boost your Holiday Spirit and earn more tips from your customers. 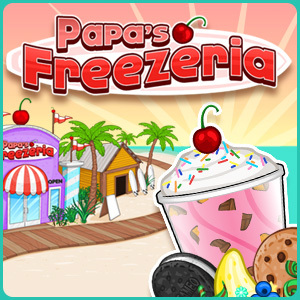 Build and bake mouth-watering pies in Papa’s Bakeria! You’re in charge of the bakery in Whiskview Mall, where you’ll be crafting new pies and cheesecakes for all of your wacky customers. Complete a wide variety of tasks to earn dozens of new colorful Stickers, and use these Stickers to unlock a brand-new outfit for each of your customers! Serve Daily Specials to your customers to earn bonuses and rare prizes, and unlock new ingredients and decorations for each of the 12 holiday seasons. 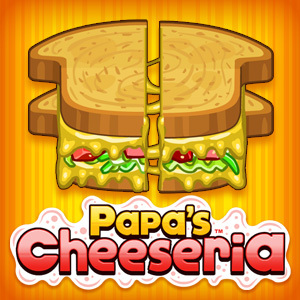 Build delicious grilled cheese sandwiches and pile on the fries at Papa’s Cheeseria! Customers can choose from a wide variety of breads, cheeses, toppings, and sauces for their sandwiches, and you’ll unlock more as you play! Create the gourmet grilled sandwiches, cook them on the grill, and serve them up with a heaping pile of fries. Unlock 40 brand-new unique Special Recipes, and choose one to serve as the Daily Special each day in the restaurant, which also earns you special rewards! 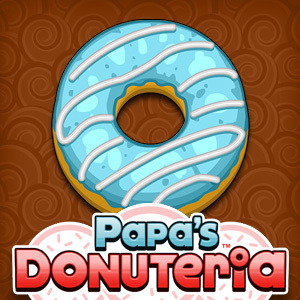 Head to Papa’s new restaurant in the Powder Point amusement park, where you’ll serve stacks of delicious donuts! Choose the correct dough and donut shape, fry the donuts, add icing and fillings, and finish them off with sprinkles and drizzles before boxing them up for your favorite customers. Unlock new holiday shapes and ingredients as you play throughout the year, waiting for the Sky Ninja roller coaster to re-open in the summer! Head to Portallini and start your career as a pasta chef! 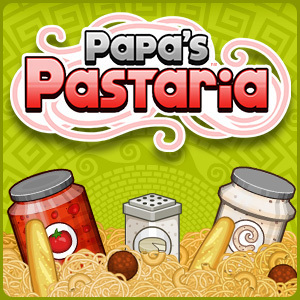 You’re in charge of Papa’s Pastaria, where you’ll take orders, cook noodles, add sauces and toppings, and toast breads to craft the perfect plate of pasta for your customers! New the series, you’ll be opening the Dining Room in your restaurant, and you’ll hire a server to help you get through the hectic workday! As you level up you’ll earn new toppings, meet new customers, and work through the ever-changing seasons of the town. 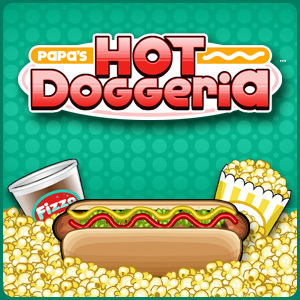 Grill and serve hot dogs and other stadium snacks in Papa’s Hot Doggeria! You’ve got the best seat in the house at Griller Stadium, which happens to be behind the counter at the hot dog stand. You’ll need to grill dogs and sausages, add toppings and condiments, pour drinks, and pop popcorn for all of the fans at the game! Help Prudence and Cooper run Papa’s Pancakeria! 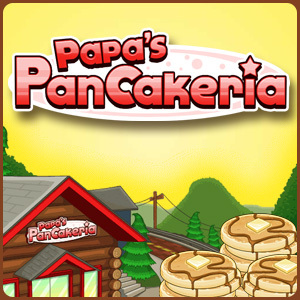 You’ll need to cook and stack pancakes, french toast, and waffles in Papa’s latest time-management game. The hands-on gameplay of the series returns, with new challenges related to stacking, arranging toppings and pouring syrup. In this latest installment, the great Foodini will arrive after each day with his traveling Mini Game Show! Foodini only accepts special tickets that are earned throughout the day, and has seven different games you can play. Each ticket gives you a chance to play his daily game to win many unique prizes. Also new to the series is an unlockable Drink Station that adds to the growing challenge of multitasking. 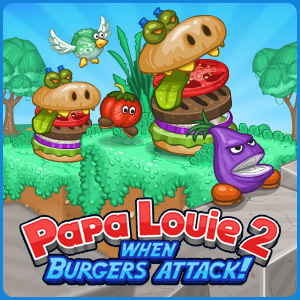 You’ve just started an easy job at an ice cream shop on a laidback tropical island, but things get hectic when all of Papa Louie’s loyal customers arrive on the island for vacation! 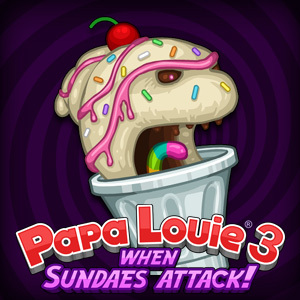 In this summertime installment in Papa Louie’s restaurant series, you’ll need to add ingredients, blend syrups and ice cream, add toppings, and serve the unique Freezeria Sundaes to your waiting customers. 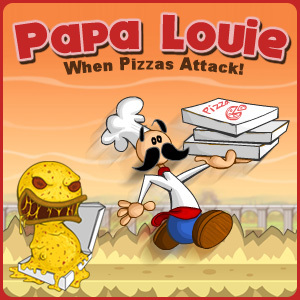 Papa Louie is branching out with a new taco restaurant, and he’s putting you in charge! 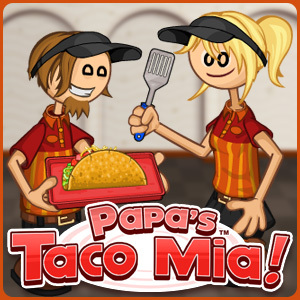 Help Mitch and Maggie take orders, cook meats, and build tacos in Papa’s Taco Mia! Unlock over a dozen toppings and sauces as you work up the ranks, and craft the perfect taco for new customers and old favorites. Buy a variety of upgrades for your taco shop using your hard-earned tips and your weekly paycheck, and take on the extra challenge of serving the tough and picky “Closer” customers at the end of each day. And if you can impress the new Food Critic, you’ll earn a Blue Ribbon award that gives you higher tips! 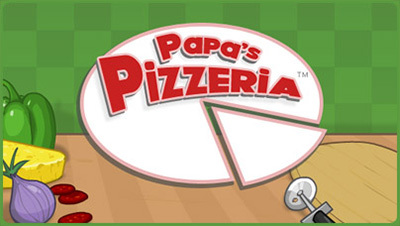 You can also earn up to 60 Badges while running Papa’s Taco Mia, unlocked for a variety of achievements including using certain toppings, getting high scores in each Station, serving certain customers, and more! 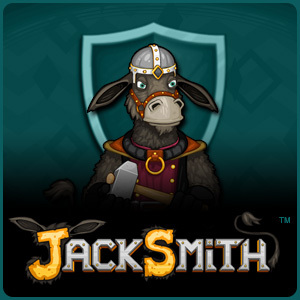 Man the forge and craft your best weapons for your warriors in Jacksmith! You’re a donkey on a mission that takes you across the land, but the trails are blocked by a variety of monsters — time to call in the local warrior clans for help! You’ll design swords, bows, shields, and other weapons in a completely hands-on blacksmith shop. When all of your soldiers are equipped, it’s off to battle to fight your way further down the path! While the warriors fight, you’ll need to gather loot and help out with your trusty cannon. Collect better ores and parts to make even better weapons, and keep making progress across the land towards the evil wizard Dudley! Return to the Land of Munchmore in this third installment of the wildly-popular platformer series! This time you’ll be exploring the Land of Munchmore’s sweeter side, but don’t let the candy fool you, it’s dangerous out there! It’s up to Captain Cori to rescue Papa Louie and the rest of the customers from Radley Madish, Luau LePunch, and an endless army of slimy Sundaesauruses. Every customer you rescue becomes a new playable character, so use their unique weapons and skills to help you on your journey and stop the nefarious plans of the wild Radley Madish! 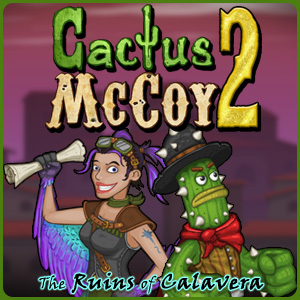 When a routine treasure hunt goes awry, McCoy is transformed into a walking cactus by the ancient Curse of Thorns. McCoy’s mission is to return the Thorned Emerald to its true home. If he fails, the curse will continue until he is a lifeless, stone cactus. Run, jump, and punch your way through an army of Enemigos sent by the monstrous Hex Hatfield. Throughout the many dangerous areas, you will find and master a barrage of weapons from razor-sharp machetes to giant bazookas. As you travel, you will uncover missing map pieces that will guide you to the source of the curse. Master the art of “Enemigo Juggling” to steal their weapons and money. You can then use your spoils to upgrade all your different fighting stats. 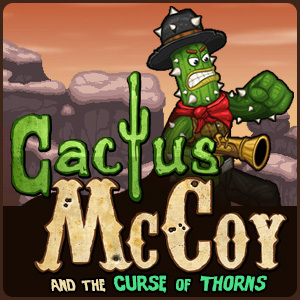 Can you become the toughest Cactus in town, and break the ancient Curse of Thorns? Help Steak and Jake deliver their milk in this unique color-matching puzzle platformer. 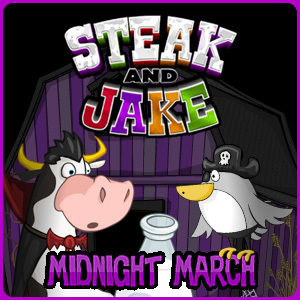 Help Steak and Jake guide the marching Ghouls along the trail this Halloween! 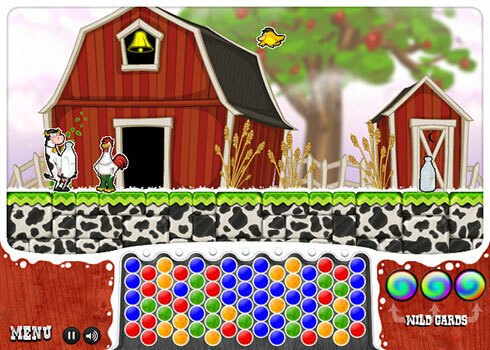 Multi-task in this puzzle-platformer, with Jake the color-changing bird matching colors in the puzzle screen, while clearing the trail above for Steak and the Ghouls. Arrange the stones in your backyard! Play through over 100 levels in this stone-matching puzzler, each with its own unique layout, environment, and collectible stone. This new “Deluxe” version now includes all of the features and content available in the download version! Two game modes are available: the Classic Game and Random Mode offering endless play. 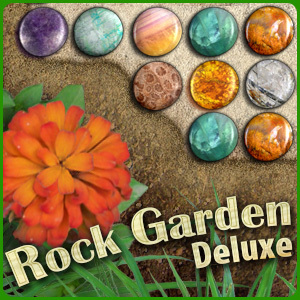 Players can earn over 100 collectible stones in the Classic Game, which can appear in the Random games and in the custom Gardens that players create themselves.